I got a few emails recently about the current writers strike in the US and whether it would have an effect on any films or TV shows showing in the UK. Initally I’d held off writing anything in depth about it as it felt a little distant from me, plus other people were covering it better and in more depth. But to make up for my slackness, here is a longer-than-usual post on the whole affair. The short answer to the question as to whether it will affect shows in the UK is “probably (given how many US shows are imported here), but it depends how serious the strike gets”. 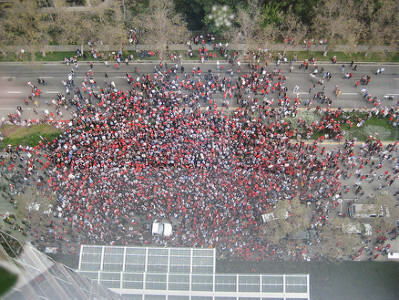 For a longer answer, more information and useful links about the strike itself, read on. If you follow it on the web, you might note how much of the coverage comes not only from established media but from different journalists, bloggers, people inside the entertainment industry and the strikers themselves. 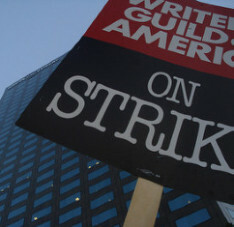 To recap, it is a strike by the Writers Guild of America (on both East and West coasts) that started last Monday. The WGA is the union that represents film, television, radio and new media writers working in the United States. Every three years, the Writers Guilds negotiate a new contract with the studios and the AMPTP (Alliance of Motion Picture and Television Producers)- the body which represents them. The dispute is about the new contract and the issue of residuals – the payments writers receive when their work is shown in different formats (e.g. DVD, cable, foreign TV). Unsurprisingly, the writers feel they are being paid too little, whilst the studios don’t want to pay them more with uncertainty over new formats and how the industry will be affected by changes in technology. The WGA has proposed doubling the residual rate for DVD sales, which would mean a payment of about eight cents (up from the current four cents) for every DVD sold. 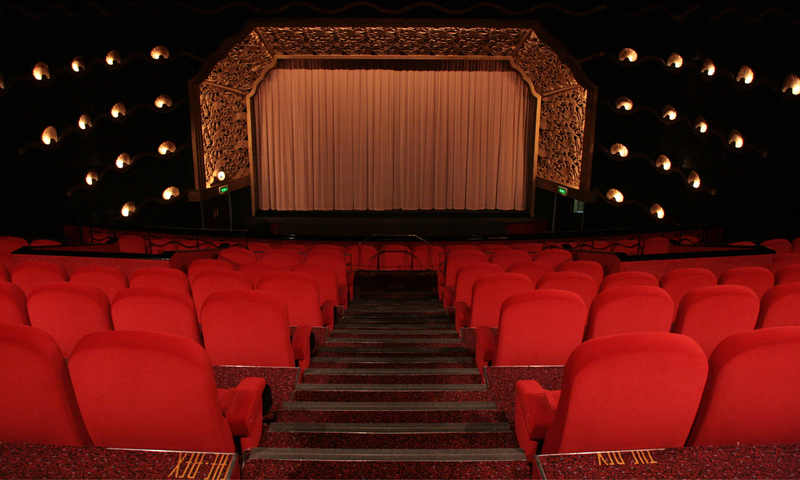 However, aside from the DVD dispute is the much more pressing issue of residuals for online content. At the moment, the WGA has no deal with the studios regarding films or TV shows sold via iTunes or streamed or downloaded online. This is a huge sticking point as it is widely assumed that online distribution will take over from DVD as the primary means for distribution. Added to the already poisonous atmosphere, there is much lingering resentment from the 20-year-old deal the WGA signed for home video – in essence the writers felt that they were not compensated for the hefty profits the studios made when DVD gradually took over from VHS in the last 10 years. Now the WGA is refusing to make any similar concessions in for so-called “new media” – which they would argue is not so new after all. WGA members are determined that the next deal can’t be like the residuals they got for DVDs. However, the studios the studios have refused to consider changing the formula. Their argument is that DVD sales are necessary to offset rising production and marketing costs. They have further insisted that the current DVD formula be applied to residuals in New Media (which covers any content sold via the web e.g. iTunes or download sites like Amazon Unbox). They would also probably argue that developments in technology are radically altering the entertainment landscape and point to the music industry as an example of how difficult predicting the future can be. YouTube didn’t exist three years ago and now copyrighted content appears there daily (albeit in 10 minute chunks). And what is the residual rate really worth if the next generation of users are downloading films and TV shows for free from sites like The Pirate Bay? I guess the the studios feel they can ride out a strike – the last major one in 1988 dragged on for 5 months and cost the entertainment industry an estimated $500 million. There are contingency plans (such as stockpiled shows and repeats) but the situation will get much much worse if other entertainment unions decide to join them in a wider shutdown of productions. In July next year, the key contracts of the other two major industry unions – the Screen Actors Guild (SAG) and Directors Guild of America (DGA) – are set to run out. If all three can’t broker an agreement with the studios, they would almost certainly engage in a wider strike that would cripple Hollywood. What’s interesting about following a story like this on the web is the depth and breadth of information from the parties involved and those commenting on it. The most obvious places to begin would be the official sites of the two organisations at the heart of this dispute: The WGA and the AMPTP. The WGA have posted their side of the argument, explaining their position and even keeping an update of where members can picket the studios (complete with links to Google Maps). The AMPTP site is a more sparse affair although it would probably be worth checking out their negotiations section for any regular updates. Speaking of YouTube, the WGA have an exstensive collection of videos on their YouTube page. Writers such as Joss Whedon, actresses like Ellen Pompeo and Katherine Heigl from Grey’s Anatomy and directors like Gary Marshall are all interviewed. Flickr is a rich source of strike photos, where you can see the likes of Jason Bateman, Jimmy Kimmell, and even Second Life avatars of strikers. Facebook is another tool people are using with groups pledging support (5127 members as I write this) and even some against the strike (327 members as I write). Nikki Finke at Deadline Hollywood Daily has probably been the most prolific with some excellent in depth coverage that has included posts counting down to the beginning of the strike, emails from the Producers Guild distancing themselves from the AMPTP and even stuff about arguments over chairs in meetings designed to bring the parties together. Anne Thompson at Variety has noted how many writers are themselves blogging about the strike (such as John August and Rob Long. David Poland points out how established outlets such as the LA Times may be partial to swallowing the studio line. Jeffrey Wells interviews screenwriters Larry Karaszewski and Diablo Cody outside Paramount. Marc Andreessen (the guy who created Netscape – the first widely used web browser) writes a telling piece on why studio execs might live to regret their stance. Peter Huck with a lengthy and informative piece in Monday’s Media Guardian. S.T. VanAirsdale reports from the picket lines in New York at The Reeler. The writers from The Late Show with David Letterman have started their own blog. Defamer has lots of gossipy links in their Hollywood Strikewatch section. Trade bible Variety has a news section on the strike and even a devoted strike blog called Scribe Vibe with regular updates. If you see any useful links then do leave them in the comments section below or just email me.